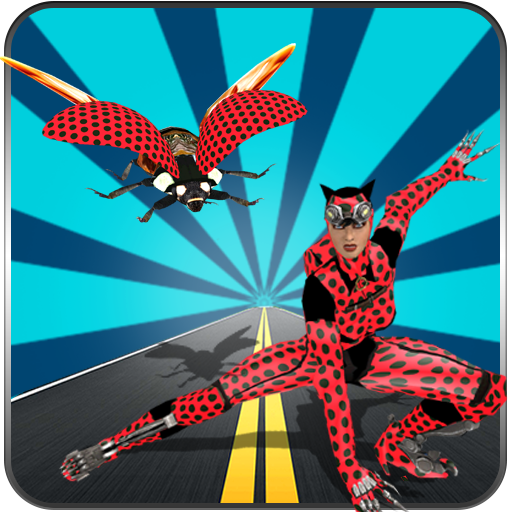 There is a city in America in which there is a famous Bank called The Gameicreate Bank. The Bank is an American worldwide banking and provides financial services. Here The bank gives the best service to the entire bank. This bank game will give the best customer service. Let's see what kind of customer service this bank is providing you. 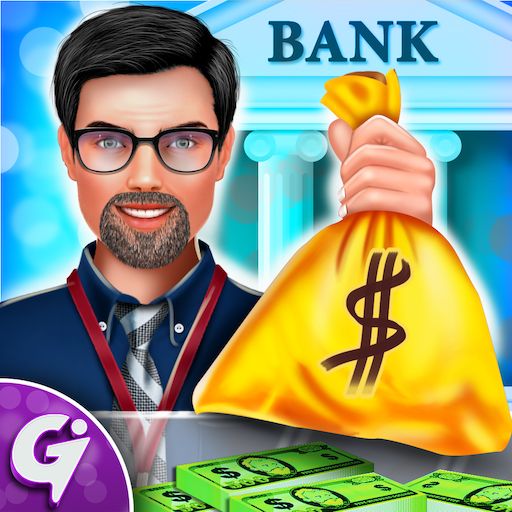 In this bank manager & cashier game, you will enjoy tons of bank education tasks. Bank customers used to stand in a queue for their turn. Managing long queues during peak hours has always been a huge problem for banks. Token system will help to reduce queue lengths and increase staff productivity and operational efficiency. One customer needs to open up her locker. You need to help her to the locker access. She doesn't know the procedure, guide her. First, help her with the key of the locker, then the fingerprint and password process after that you need to take her to the locker room. Use the bank key to open the locker. After the locker process takes the key & put it in the key box. The bank needs to keep all the bank money to the Bank locker. And there's certain procedure for the security, to take the money into the bank locker. Firstly, there will be verified of the employee. Name of the employee, issue date on me-card and signature is verified by the security. There will be fingerprinted and password verification. Then put all the money in the Bank Locker after accessing the locker password. 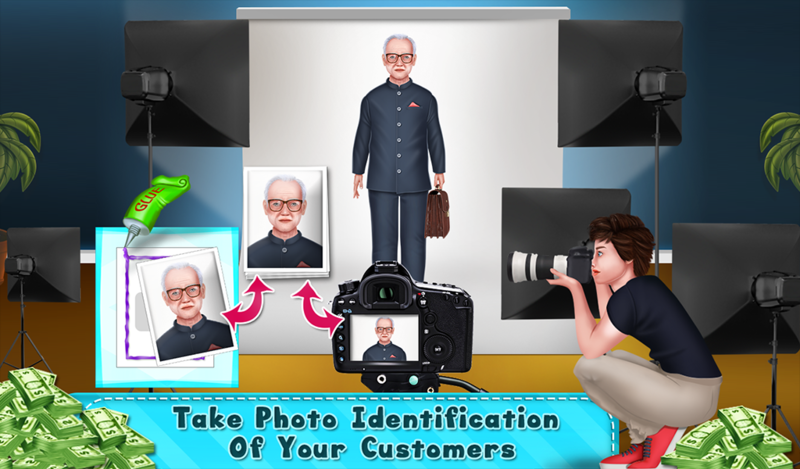 Bank has a vacancy and there are lots of candidates for the same, let's test their knowledge. Remember in order to get selected, candidate needs at least 11 correct answers within a stipulated time period. You can always use lifelines if you are stuck somewhere. If you got 11 correct answers, Welcome to The Bank. Banks need a tight security and for that surveillance, room plays an important role. There are cameras in each and every corner of the Gameicreate Bank. In here, the room is in a complete mess. We need to clean this room with the help of different tools available in the side panel. Clean the Surveillance room and make it look neat and tidy. Withdraw money from an ATM machine, clean it if required & by any chance if it is not working properly call the technicians from the nearest branch of the bank to repair it. 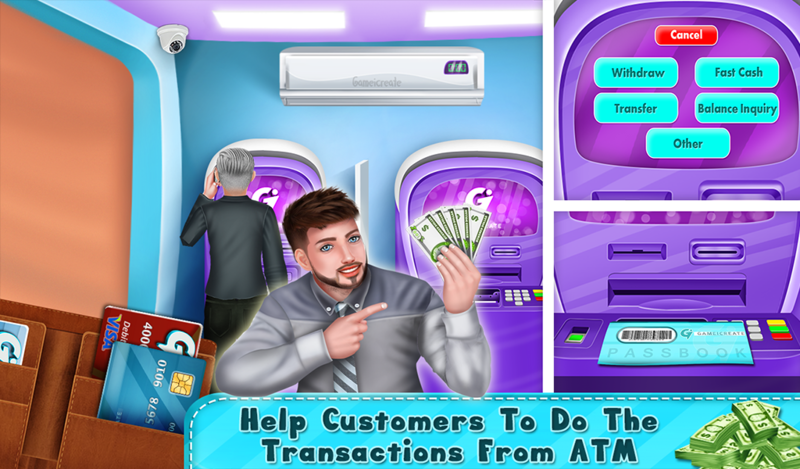 Enjoy banking & transact the amount you want from the money machine. ATM machine of this area doesn't have enough cash, so cash from the branch's vault is to be brought in by cash carrying vehicle as soon as possible. Open the lock, transfer the cash to their respective sections and lock it again for security purpose. Server room of bank has some major break down before the things get worse, we need to immediately repair it. Fix and change the parts which are not working. 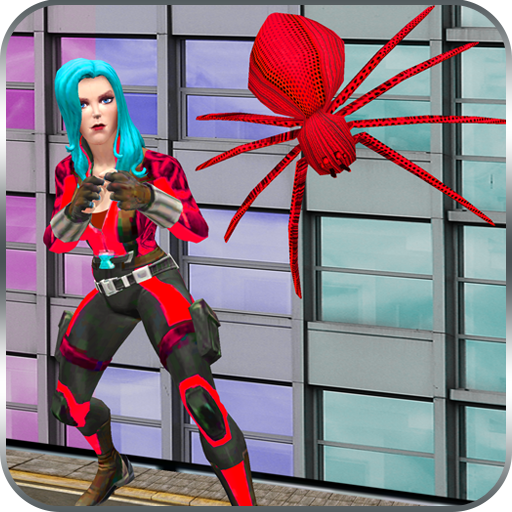 Make the server room perfectly operational again, so that there is no trouble in future in Gameicreate bank. In here, customer is in need of loan. But certain procedure is to be followed for getting the loan approved. Even the manager's signature is required for the approval. 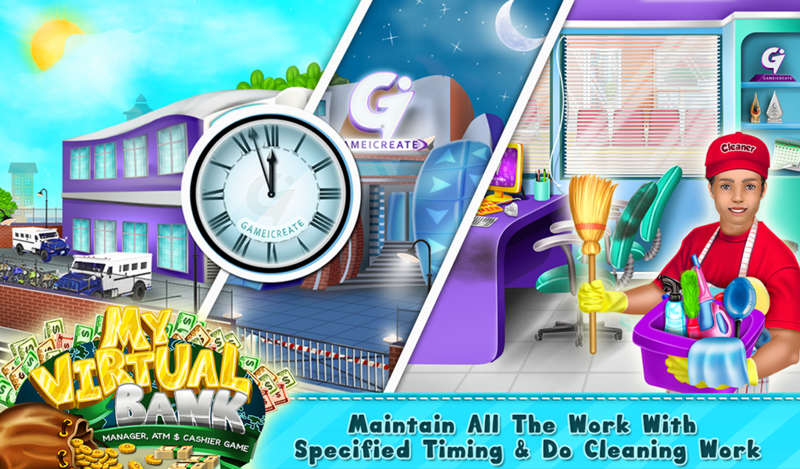 The manager's cabin should be spotless if in case it's not, then clean the cabin. 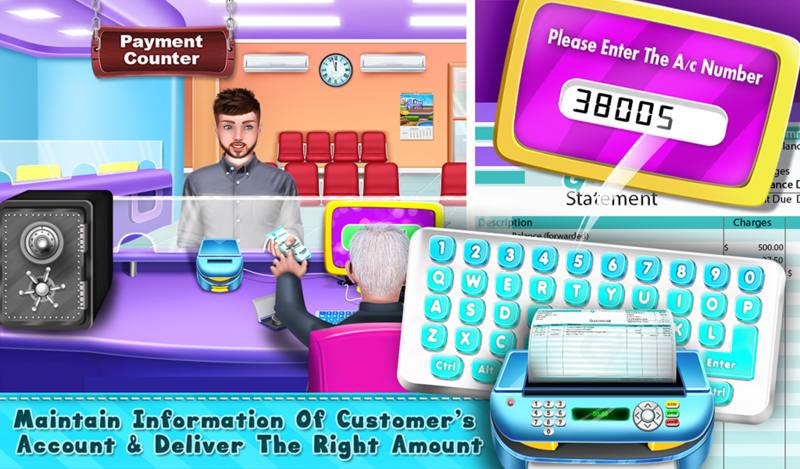 Play this amazing game - "My Virtual Bank Manager, ATM & Cashier" and learn all the procedures of bank by doing it on your own. Friends, Its time to play with MONEY ! !